HINT: Put a piece of shop rag or equivalent into the inside of the universal joint cover so that the boot does not touch the inside of the universal joint cover. (c) Place matchmarks on both the flanges. (e) Remove the 4 bolts, 2 adjusting shims and propeller shaft w/ center bearing shaft assy. (f) Insert SST in the transfer to prevent oil leakage. (a) Place matchmarks on both the flanges. (b) Remove the 4 nuts, bolts and washers. (a) Place matchmarks on the joint and flange. NOTICE: Do not make matchmarks with a punch. (b) Using a hexagon wrench (6 mm), remove the 6 bolts and 2 washers and separate the intermediate shaft from the rear propeller shaft. (a) Check the spider bearing axial play by turning the flange while holding the shaft tightly. HINT: If necessary, replace the shaft. (a) Using a dial indicator, inspect the runout of the shaft. HINT: If the shaft runout exceeds the maximum, replace the shaft. (b) Using a dial indicator, inspect the front side of the intermediate shaft flange runout. (c) Using a dial indicator, inspect the rear side of the intermediate shaft flange runout in the horizontal direction. HINT: If the intermediate shaft flange runout exceeds the maximum, replace the intermediate shaft. (d) Using a dial indicator, inspect the rear side of the intermediate shaft flange runout in the vertical direction. (a) Using a dial indicator, inspect the runout of the propeller shaft. HINT: If the shaft runout exceeds the maximum, replace the propeller shaft. (a) Using a chisel and a hammer, loosen the staked part of the nut. (b) Using SST to hold the front flange, remove the nut and plate washer. (c) Place matchmarks on the rear flange and shaft. (d) Using SST, remove the rear flange. (e) Remove the center support bearing assy No.2 and plate washer. (c) Place matchmarks on the front flange and shaft. (d) Using SST, remove the front flange. (e) Remove the center support bearing assy No.1 and plate washer. (a) Turn the bearing by hand with applying force in the rotation direction. Check the bearing turns smoothly. (b) Check that the seals are not cracked or damaged. HINT: If the bearing is damaged, worn, or does not turn freely, replace it. (a) Inspect the center support bearing assy No.1 by the same procedures with center support bearing assy No.2. (a) Using a dial indicator, inspect the runout of the rear propeller shaft. HINT: If the shaft runout exceeds the maximum, replace the rear propeller shaft. 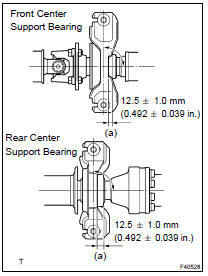 (a) Set the center support bearing assy No.1 on the intermediate shaft, as shown in the illustration. (b) Install the plate washer to the intermediate shaft. (c) Align the matchmarks on the front flange and shaft and place the flange on the shaft. (d) Using SST to hold the front flange, press the center support bearing assy No.1 into position by tightening down a new nut and plate washer. (f) Torque the nut again. (g) Using a chisel and a hammer, stake the nut. (a) Set the center support bearing assy No.2 on the shaft as shown in the illustration. (b) Install the plate washer to the shaft. (c) Align the matchmarks on the rear flange and shaft and place the flange on the shaft. (d) Using SST to hold the front flange, press the center support bearing assy No.2 into position by tightening down a new nut and plate washer. (a) Align the matchmarks on the intermediate shaft and rear propeller shaft, then install the 2 washers and 6 bolts. (b) Using a hexagon wrench (6 mm), tighten the 6 bolts temporarily. (a) Align the matchmarks on the propeller shaft flange and differential companion flange, and connect the shaft with the 4 bolts, washers and nuts. 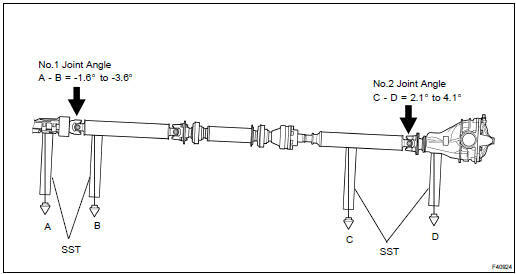 (b) Check that the each joint of the propeller shaft is facing to the direction, as shown in the illustration. (b) Remove SST from the transaxle. (c) Insert the yoke into the transaxle. (d) Install the 2 adjusting shims and propeller shaft w/ center bearing, and temporarily tighten the 4 bolts. (e) Tighten the 4 nuts. (a) Remove the shop rag to the joint. (b) Using a hexagon wrench (6 mm), tighten the 6 bolts. (c) With the vehicle unloaded, adjust the dimension between the rear side of the cover and shaft, as shown in the illustration. (d) Under the same condition as (a), adjust the front and rear dimensions between edge surface of the center support bearing and the edge surface of the cushion to 12.5 1.0 mm (0.492 0.039 in.) respectively as shown, then torque the bolts. (e) Check that the center line of the bracket is at the right angle in the shaft axial direction. (f) If any vibration or noise occurs, perform joint angle check as follows and replace the adjusting shim with proper one. Turn the propeller shaft several times by hand to stabilize the center support bearings. Using a jack, raise and lower the differential to stabilize the differential mounting cushion. Remove the transfer dynamic damper. Using SST, measure the installation angle of the transfer (A) and front propeller shaft (B). Using SST, measure the installation angle of the rear propeller shaft (C) and rear differential (D). HINT: If the measured angle is not within the specification, adjust it with the center support bearing adjusting shim. (g) Install the transfer dynamic damper.